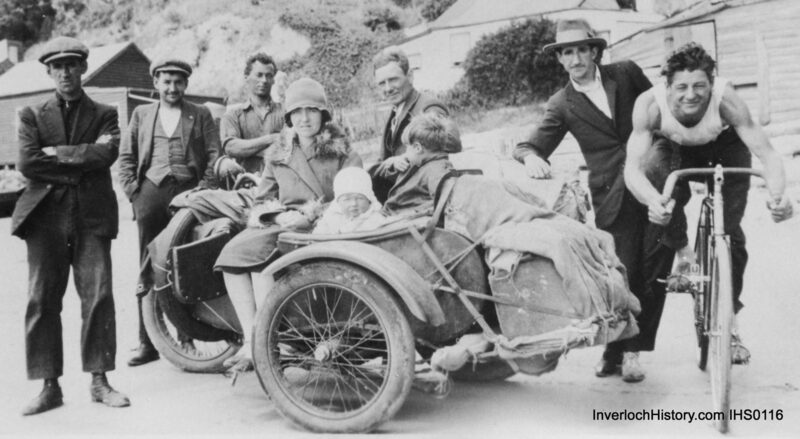 As the Society continues to develop its collection through our Digitisation Program, many photographs of Inverloch’s past are becoming available to all via the internet. Shining through are many examples of individuals and groups involved in community activities. The two buildings depicted below are examples of this. On the left side of this photograph is the original CFA fire station constructed in 1958, while the building on the far right shows the “new” CFA fire station built in the 1978. Both now gone & replaced with a larger modern building on the same A’Beckett St site in 2010. 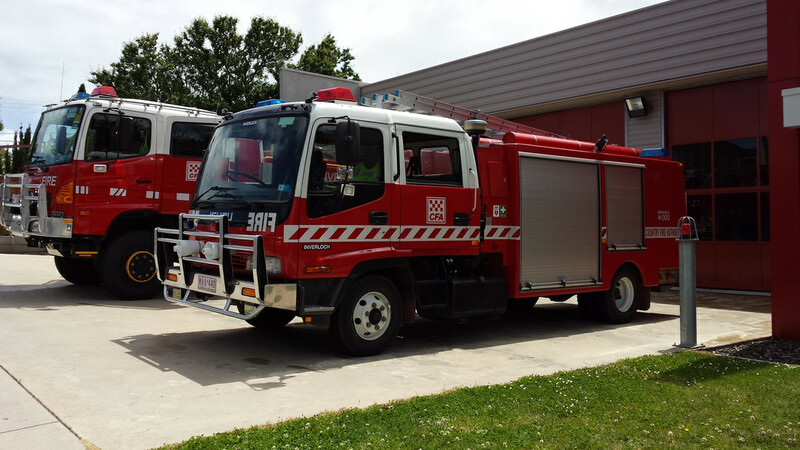 More on the history of the Inverloch Rural Fire Brigade. 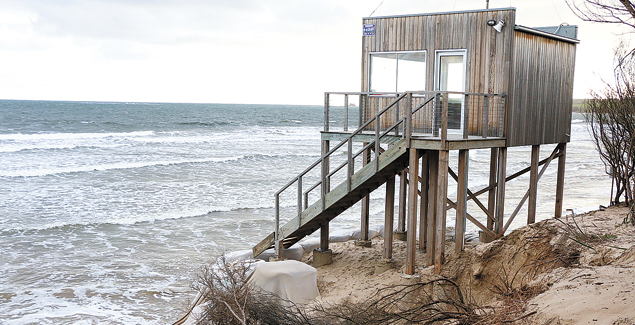 The Inverloch Surf Life Saving Club’s watchtower, just recently relocated a couple of hundred metres west up the beach. Volunteers bring a vigour and warm-hearted response to all that they do. It is very encouraging to our Committee when members volunteer to help with the many and varied tasks that keep us going. No matter how big or small those tasks are, all contributions make a difference and are valued. We simply could not achieve our objectives if we didn’t have the help of so many. So, I challenge all members to keep up the good work. Rejuvenation of Ripple is almost complete. Bass Coast Shire Council is to be congratulated for funding its renovation. The Society has been asked to provide photographs and information for the display panels around the ketch. The earlier panels have faded and become unreadable and Council’s request has led to quite a search to find the originals and has given us the opportunity to improve upon what was there. Member Ray Burtt and I have really had our noses to the grindstone, but the end result will be well worth the effort. Ripple’s steering wheel, previously displayed on a board be-hind the ketch, had deteriorated to the point of falling apart. The wheel has been reconstructed by Inverloch Men’s Shed, another volunteer community organisation. The renovated wheel looks magnificent and will be installed in the coming weeks. We appreciate their generous support and will make a donation to their organisation. Have you seen the Society’s website recently? Well, if you haven’t, have a good look right now. Member Rod has done a marvellous job so far. He is a man of energy and ideas! We need ideas and positive suggestions to take forward our aims and aspirations for the Society. Rod is helping members, and others who visit the website, to see a more informative, bigger and brighter picture of Inverloch since 1886. Well done! Several Society members (John Hutchinson, Terry Hall, Lynn Kirk & Ray Burtt) met at the Council’s offices with Mayor Cr Pamela Rothfield, Dep Mayor Cr Brett Tessari, Cr Julian Brown, Cr Les Larke and several members of Council‘s staff, to discuss the issue of the use of a Crown Land site near Inverloch jetty, with a view to constructing a museum on that site. The meeting lasted an hour and we were well received. Our research was appreciated and well worth the effort taken. We thank the Councillors and staff for their time and the opportunity to develop our ideas. We came away pleased with our progress so far. With no building to call our own, adding new material to the collection can be a major problem for the Society. Conveniently, and with some relief, it will be extremely pleasing to know that passing your old photographs and artefacts to the Society no longer means we will keep them. Should you not wish to donate your photographs etc., you can simply lend them to us for a couple of weeks and they will be returned after Graham Paterson and Susan Hacker have scanned and catalogued them. Graham recently took me through some of the recently added photographs. It was exciting to see the range, the interest and the sheet beauty of some of the old materials. We will have much to display at our forthcoming Exhibition at the Hub for all of August 2018. Our annual fundraising raffle will be held during August 2018 to coincide with the Exhibition at the Hub. Committee member Lloyd Bennetts has volunteered to organise the raffle. Details will be announced soon. As is our tradition, the Society placed a wreath at the ceno-taph at Inverloch on ANZAC Day. The RSL is a strong supporter of our work and aspirations. The historical display in the RSL Hall, curated by Colin Leviston, is first class. Colin does outstanding work. More on the history of the Wonthaggi Coal Mine & its relevance to Inverloch.